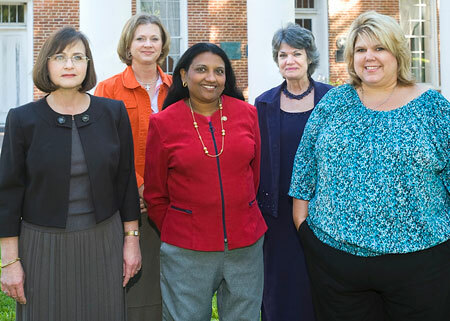 Faculty members in SHSU's new nursing program, which will accept its first cohort of 35 students in January, include (from left) Louise Plaisance, Lori Neubauer, Susan Mathew, Mary Anne Vincent and Kerri Cravey. The highly anticipated Bachelor of Science in Nursing degree program at Sam Houston State University has been given the green light by both the Texas Higher Education Coordinating Board and the Texas Board of Nursing and will take its first cohort of 35 students in January. "We are delighted that the Board of Nursing and the Higher Education Coordinating Board recognized the high quality of the proposed nursing program and the pressing need for it in our area,” said SHSU Provost and Vice President for Academic Affairs David Payne. "This program will open the way for a dramatic expansion of Sam Houston State University offerings into a variety of allied health professional programs which will be developed over the next few years,” he said. The nursing program is a department within the College of Arts and Sciences. The college is headed by Jaimie Hebert, who was instrumental in laying the groundwork for the establishment of the program, according to Payne. “We are very fortunate to have found such high quality nursing faculty who have the experience and the skill that was necessary to present our case so effectively under the leadership of Dean Jaimie Hebert to those accrediting bodies,” said Payne. Louise Plaisance was hired last year as associate dean of nursing to develop the curriculum for the new program and serve as its director. She has 28 years of nursing education and administrative experience. Since then, four additional faculty members have been hired including Kerri Cravey, Lori Neubauer, Mary Anne Vincent and Susan Mathew. Plaisance, who holds undergraduate and graduate degrees in nursing and a doctorate in nursing science, worked with nursing education consultant Ellarene Sanders to prepare the proposal for board review. There are no professional nursing educational programs within a 40-miles radius of Huntsville and only one vocational nursing program in the local area. Currently more than 240 students are enrolled in the pre-nursing program at Sam Houston State and those surveyed have expressed a strong interest in continuing their education at the university. Before now, pre-nursing students had to go to other universities to complete a bachelor’s degree. In addition to civic leaders from Huntsville and surrounding communities who have endorsed the new nursing program, physicians in the area across several specialties wrote letters of support for the program, which were included in the proposal, according to Plaisance. Local health care facilities have indicated to Sam Houston State that space is available and students are welcome to do their clinical work at those locations. “The university has agreements with Huntsville Memorial Hospital, East Texas Medical Center in Crockett, and two long-term care facilities in Huntsville,” said Plaisance. The Department of Nursing is currently located in Academic Building III on campus, which has been renovated to include space for classrooms, offices, a conference room, and a skills laboratory. “The program is designed for students to gain nursing skills through skills laboratories simulation experiences before hands-on patient care learning activities,” said Plaisance. Although the nursing program is new to Sam Houston State, university officials are already exploring the possibility of adding an RN-to-BSN program. In this program students who have completed a two-year associate degree program would be able to take courses totally online for the completion of a bachelor’s degree in nursing science. “We look forward to the expansion of the nursing program into articulation with other nursing programs and graduate programs in addition to the basic baccalaureate in nursing,” said Payne. For more information about the Department of Nursing at Sam Houston State University log onto www.shsu.edu/~nursing or call 936.294.2371.